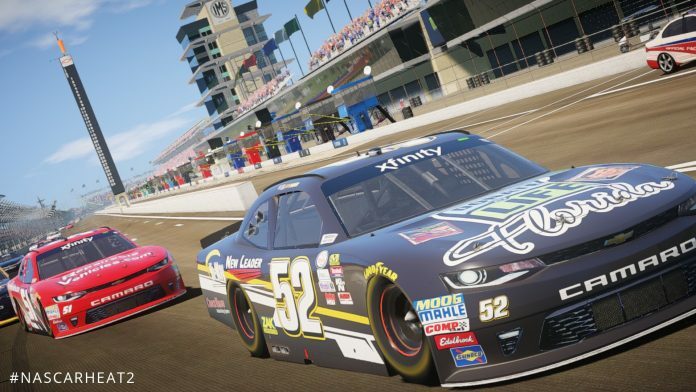 NASCAR Heat 2 developer 704 Games has put the pedal to floor in order to build up the anticipation for the upcoming racing title. Promising an increased depth to the game’s career mode as well as it’s on-track racing, 704 Games is looking to show fans exactly what they’ve been working on since NASCAR Heat Evolution was released last year. To do so, the team has released its first developer diary. The diary, which you can watch in full below, features some all new gameplay from the split-screen multiplayer mode as well as a look at dirt-track racing with the debuting Camping World Truck Series. The design team also touches on what is was like for them to implement the new stage racing system that NASCAR began using with the 2017 season. And before you ask, there will be stage racing and accurate flags when playing online with friends. Last but not least, it was announced that the career mode will start players in the Truck Series, with the ultimate goal being to end up racing in the Monster Energy Cup Series.